Our AESH Fuel Cell systems do not require any fuel delivery because it is able to produce its own fuel on-site. The technology is based on self-generating fuel cells (water) by recycling the by-products to produce and generating energy. Power production: The AESH will generate power OnSite when power is needed by utilizing water and warm air. Competitors need to deliver the hydrogen and methanol which generates more cost in logistic service. The technology was Founded in 2005 and is ISO 9001 and 14001 certified. The OnSite AESH power system over comes the biggest obstacles toward mass deployment of fuel cells – the sourcing (purchase and transport) of hydrogen. Our OnSite systems are more robust, produce less noise and can work at any air quality condition – from heavy pollution to blizzard or monsoon to desert storms. 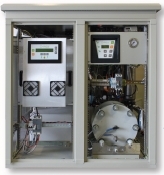 Our OnSite AESH power systems are commercially available and we can provide customized solutions.